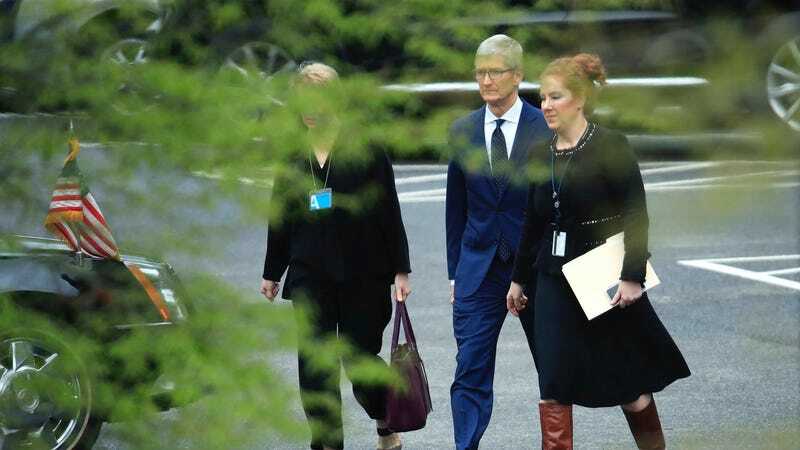 Tim Cook most recently met with President Trump on April 25th at the White House, a day after attending the state dinner for French president Emmanuel Macron. But the Apple CEO hasn’t discussed what he and Trump talked about, until now. Cook struck a diplomatic tone with Bloomberg TV, discussing his thoughts on the Trump regime with the calm and level-headedness of an old school politician. But Cook made it clear that he wasn’t happy about the tariffs on Chinese goods, while acknowledging that some people have been hurt by the trade imbalance between the U.S. and China. It’s generally understood that Apple hasn’t been negatively affected by the Chinese tariffs yet, despite manufacturing virtually all of its products in the country. But Cook has many reasons to want to keep the Chinese government happy, not least because China’s rising middle class has become an important consumer market for Apple. Sales of Apple products in China reached $18 billion last quarter. Cook reportedly spoke with President Trump about the issue of DACA, the Obama-era program that allowed immigrants brought to the U.S. as children to stay in the country and live with a semi-legal status. Trump ended the program and the lives of almost a million people have been in limbo ever since, wondering at any given moment if they’ll be deported. “We’re only one ruling away from a catastrophic case there,” Cook told Bloomberg’s The David Rubenstein Show. And he’s absolutely right. The failure of Congress to do anything about DACA in the wake of Trump’s killing the program leaves it up to the courts. And those courts are just getting more and more conservative under the Trump regime. Cook looked visibly uncomfortable at the White House state dinner on April 24th, but there are certainly elements of Trump’s policies that Cook likes. Cook spoke about the enormous corporate tax cuts that Apple and other companies received from Republicans—a massive transfer of wealth to the richest Americans. Cook, as you might have guessed, is a big fan of the tax cuts. President Trump has previously bragged that he got Apple to invest $350 billion in the U.S., which is objectively untrue. And Cook, during his interview with Bloomberg, tried to make the case that it was great for America because Apple would be buying back its own stock—$100 billion in stock to be precise. Sure, Tim. Sure. Whatever lets you sleep at night.